Swallow's Nest01768 862568work Self-cateringImmaculately presented Visit England 4 Star Gold Award sandstone barn conversion. Furnished and equipped to a high standard, Swallow's Nest, an "upside down" property has open plan living area with adorable wood burning stove, dining area with french doors leading onto a Juliet balcony. Fully fitted and equipped modern kitchen. TV with Freeview, DVD, CD/iPod dock, Wi-Fi. Solid oak woodwork throughout with original sandstone floor hallway. Fuel, power and starter pack for wood burning stove included in rent. Two bedrooms to sleep 4, a double bedroom with ensuite and a twin bedroom. Family bathroom with modern facilities and contemporary design. Bed linen and towels included in rent. Off road parking for 2 cars. Ideally situated to explore the quaint villages dotted around. Close by C2C cycle route. 4 miles north west of Penrith, which has a wide selection of independent shops, cafes, bars and pubs. 12 miles to Ullswater and less than 20 miles to Keswick. Swallow's Nest offers weekly bookings starting on Saturday. 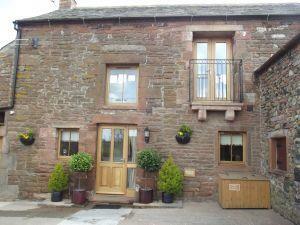 Immaculately presented Visit England 4 Star Gold Award sandstone barn conversion. Furnished and equipped to a high standard, Swallow's Nest, an "upside down" property has open plan living area with adorable wood burning stove, dining area with french doors leading onto a Juliet balcony. Fully fitted and equipped modern kitchen. TV with Freeview, DVD, CD/iPod dock, Wi-Fi. 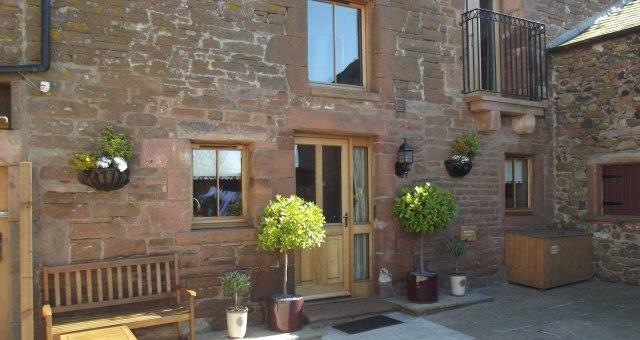 Solid oak woodwork throughout with original sandstone floor hallway. Fuel, power and starter pack for wood burning stove included in rent. Two bedrooms to sleep 4, a double bedroom with ensuite and a twin bedroom. Family bathroom with modern facilities and contemporary design. Bed linen and towels included in rent. The property has been refurbished to an exceptional standard to provide contemporary accommodation whilst retaining original features. Sorry, no pets and no smoking. Exit M6 jct 41 and take B5305 exit to Wigton. In 50 yards turn left into the village of Catterlen. Low Dyke Self Catering Cottages are just past first property on left, through open gate into courtyard.